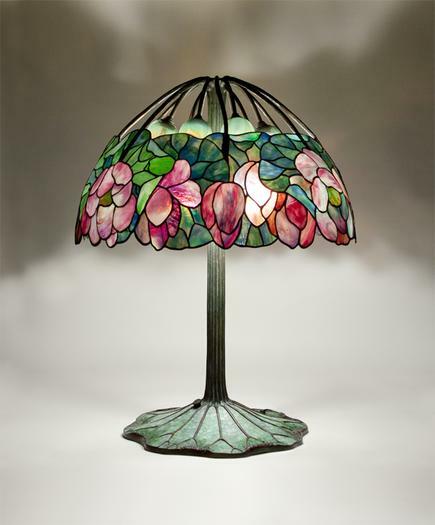 This extremely rare original Tiffany Studios Lamp is one of three known examples of the Lotus model; each version of the lamp is slightly different in the configuration of the leaded glass shade, featuring a lower register of richly colored pink lotus blossoms against a green background, and the selection of the favrile glass globes which represent opening lily buds. This example features green and opalescent Tiffany Favrile Glass Tulip shades with green iridescent feathered decoration and ruffled rims and a bronze base in the form of a lotus leaf, formed by sections of inlaid favrile glass tesserae in shades of variegated greens and chased bronze. This particular example of the model was used to advertise the lamp in an original Tiffany Studios leather-bound photographic album dating from the period. Priced at $750 in the firm's 1906 Price List, this spectacular model was the most expensive of all the lamps sold by Tiffany Studios at that time.